Jamey brought in a big, beautiful bowl of our fall broccoli the other day. The thing with home-grown broccoli, we are discovering, is that it's prone to worms (and bugs). This was our first successful attempt at growing broccoli, so this was all new to us. This year, we didn't use anything to try and discourage these critters. Next year, we will. Jamey is looking into some safe worm deterrents. If they are successful in warding off the worms next year, we'll let you know. As I started cleaning the broccoli, I remembered. Earlier this year I had my first run-in with the slimy worms that love our broccoli so. Big sigh. Muster up courage. Stomach be strong. I started pulling and scraping them off, collecting them in a jar for Minn (who didn't even want to eat them). All of a sudden it occurred to me. Why am I doing this? Didn't I give birth to a little girl who loves worms and all manner of creeping, slimy things? I called for Sadie and she dove right in, extracting worm after worm. Bless you, my child. Bless you. 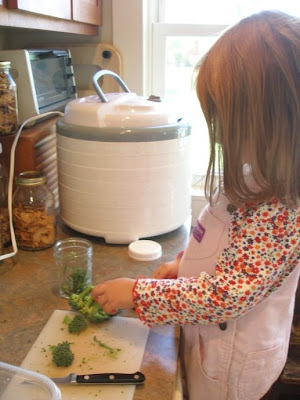 Now, if you can get past the worms, here are some instructions for freezing broccoli that I gleaned off the internet, mostly from pickyourown.org. Soak broccoli for 30 minutes in a brine made of 4 tsp. salt per 1 gallon of water (this is to kill bugs). 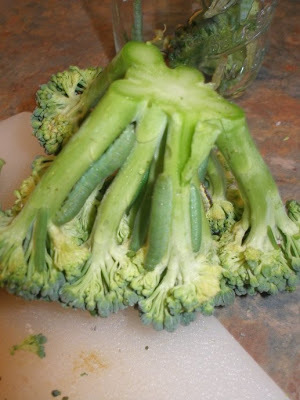 Drain and rinse broccoli. Place broccoli into boiling water and let cook for 3 minutes. Next, remove broccoli and place it in very cold water (ice cubes work well) for 3 minutes. Drain well and freeze in plastic freezer bags. Note: This is the first year we are freezing broccoli, so I cannot vouch for the above method as of yet. Those worms are just a little too camouflaged for my liking! Yikes! I'm looking forward to tomorrow's post...we're in this together!! That worm jar is looking pretty full, YUCK! My parents would soak them in salt water for 15 minutes. It make the worms come out of the broccoli. Then, give them a look over to make sure none remain. This was our first year with broccoli, too. We didn't have trouble with bugs, but did have those worms all over ours...some kind of caterpillar, aren't they? We had a lot of cabbage whites flying around our broccoli plants. I got rid of them by putting the broccoli (in small batches) in a big bowl of cold water and agitating for a few minutes. I didn't want to soak all those water-soluble vitamins right out of it. The caterpillars sunk to the bottom and the broccoli floated, so I could skim the broccoli and dump the wormy water out for the chickens to enjoy. As I cut the broccoli into smaller florets, I found a few small ones hiding out, but picked them and did a second quick rinse just to be sure. We might try using BT / BTK next year because dealing with them at harvest time was too time intensive. Just curious if you've frozen broccoli since posting this article. I'm just now finding your site and you have some great information here. I try to freeze broccoli but find that no matter how much I drain my broccoli, when I use my vacuum sealer, it still squeezes out too much liquid and ends up making my sealer quit working. I haven't found a good method yet. We've frozen broccoli like this every year since and it's worked very well. In fact, because we don't seem to do very well at growing broccoli, we've been buying from a farm and freezing large amounts of it this way. The broccoli is excellent in casseroles and other dishes (versus stand alone). We're sad when we run out! I encourage you to try it:-). After you cool your broccoli, blot dry and place on wax paper on a cookie sheet. Freeze overnight. Then put in your vaccuum bags and you won't have any prob. Broccoli likes cool weather. Plant them EARLY in the spring -they can handle cold weather and they will grown nicely. They also need a lot of "food" in the soil - we Miracle Grow and use chicken poop.